TALLAHASSEE, Fla. (AP) — Racism immediately became an issue in the Florida governor’s race Wednesday as both nominees made predictions: The Democrat said voters aren’t looking for a misogynist, racist or bigot, while the Republican said voters shouldn’t “monkey this up” by choosing his African-American opponent. 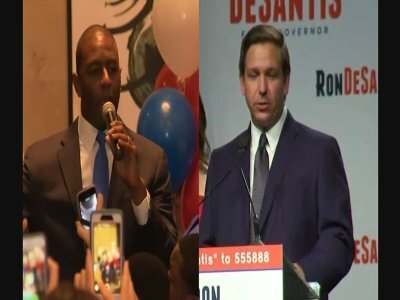 Only hours after their primary election victories, Tallahassee Mayor Andrew Gillum and U.S. Rep. Ron DeSantis made clear the high-profile race in the nation’s largest political battleground state was going to be nasty. Gillum, a far-left Democrat seeking to become the state’s first black governor, and DeSantis, a Trump-endorsed Republican, are political opposites, both seeking to gin up turnout among the party’s most ardent supporters. Democrats immediately decried DeSantis’ comment as racist. But the DeSantis campaign clarified that his comments were directed at Gillum’s policies, not the candidate himself. “To characterize it as anything else is absurd,” his spokesman Stephen Lawson said. They’re seeking to succeed Gov. Rick Scott, who can’t run for re-election because of term limits. “That is not what Floridians want,” DeSantis declared. Tallahassee has had one of the Florida’s highest crime rates in recent years though it has been going down. DeSantis, who turns 40 next month, is a former Navy lawyer who won his seat in 2012 running as a Washington outsider. He entered the governor’s race a month after Trump’s December tweet that he would make “a GREAT governor.” Later Trump held a rally for him in Tampa. Gillum was a 23-year-old Florida A&M student when he became the youngest person elected to the Tallahassee City Commission in 2003. He was elected mayor in 2014. He’s a gifted public speaker who did well in debates, often receiving the most applause, but the FBI is investigating Tallahassee city hall for alleged corruption. Gillum has said he’s not a target. Gillum didn’t make race an issue in the primary. But he acknowledged in a recent interview that it would be “big” to be Florida’s first black governor.